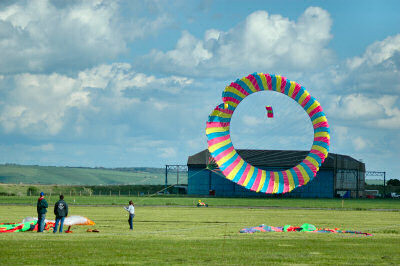 With almost perfect weather for it I spent the afternoon at the Swindon Kite Festival. It took (actually, as of writing this it is still taking place, if you don't have any plans for Sunday the 8th of May 2005 I recommend to go to the second day) place at the Wroughton Science Museum at Wroughton Airfield. While there were some clouds it was mostly dry and sunny as well as fairly windy. While there were quite a few kites I found the kite buggying from the British Buggy Club (BBC) the most fascinating part. 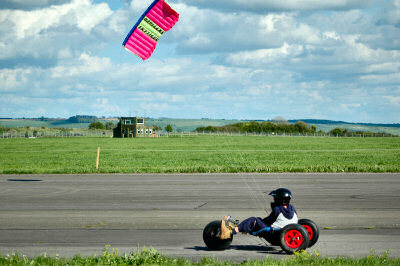 They pull tiny buggies with large power kites. And they get amazingly fast, apparently they can reach speeds of more than 40mph. I saw someone measuring speeds with one of these speed guns, unfortunately I didn't get round to ask what the highest speed they had measured today was. 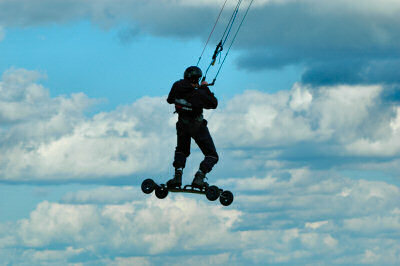 There were also a few "kite surfers", using oversized skateboards with their kites. Some showed quite impressive jumps, although not all managed landing again perfectly. I believe this is an annual event, almost certainly something I'll visit again next year. I'll probably also put a page with a few more pictures together, link to follow.